April is a big month for science-related events and activities, so it's time to pull out those planners. April 24, 2010 is International Astronomy Day (Astronomy Week: April 19-25) . For more information, check The Astronomical League website. You also might want to look for local events at your regional astronomy organizations, such as the Canadian Astronomical Society. Many clubs will have their telescopes out for public viewing sometime that weekend. 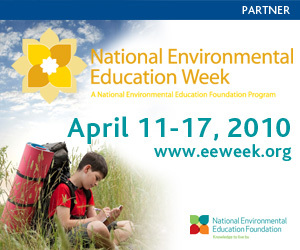 National Environmental Education Week is April 11-17, 2010. Spend some time at this website. Activities range from a photo blog contest to Nature and Water Bee Quizzes. Then from April 17 through 25, 2010 are the Earth Day celebrations, with Earth Day being April 22. This year is the 40th anniversary. The website seems to be a bit unorganized, for example the Earth Day events listed under the programs tab are for 2009 events. 2010 events can be found in the left sidebar. Arbor Day is April 30, 2010 or the last Friday in April. Some states celebrate on a different date if that is a better season to plant trees for that area. For example, we celebrate Arbor Day in March in Arizona. 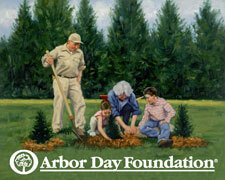 Check the clickable map of the US for dates of Arbor Day celebrations in your state. The map also gives your state tree. The site also has an interactive book about the history of Arbor Day. Finally, if you children are interested in wildlife and nature, take a look at these cool Wild Times magazines available free in .pdf format. They are beautifully done.